An exhibition of extraordinary refinement and of considerable emotional impact took place at the Municipal Gallery of Campione d'Italia, which is a precious casket of cultural traditions in fact the historical roots of the Community of Campione dated back to the Longobard reign when in the second half of the eighteenth century Totone built his fief by the lake Ceresio, then he gave it in , thanks to a will, to the Basilica of Saint Ambrose in Milan in the person of the Archbishop Thomas. From that legacy the link of Campione always crossed the Milanese Diocese for over a millennium. During this period Campione was the cradle of a group of artists, the Masters of Campione(Ugo, Giovanni, Bonino, Zenone and Matteo who are the most important) who brought and spread in the Northern Italy their art, taking inspiration from their native lake land and letting their mark in many churches. The former Church of Saint Zenone, which is now a Municipal Gallery, is a chest of the native work of these artists: a real will of art. 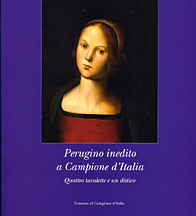 The exhibition is the fruit of the collaboration between the Municipality of Campione d'Italia, the Superintendency of cultural heritage of Umbria and the University of Perugia; it brought into the enclave 12 works by Pietro Vannucci, known as the Perugino, a Renaissance painter of Umbrian origin, who lived between 1450 and 1523. Some of the displayed works of art come from a private collection of the Ticino Canton. The Professor Federico Mancini, Director of the Department of Human Sciences and of the Formation for the Perugian University , fitted out the preparation with critical analysis. This exhibition allowed a lot of visitors enter in contact with the complex dynamics of one of the most prestigious and prolific laboratories of art of the Italian Renaissance. And there we are in front of the diptych of the Christ crowned of thorns and the Virgin, a chief attraction of the entire collection and wisely set in the side chapel of the former Saint Zenone church, in order to increase and save a familiar intimacy. An undeniable perspicacity of the manager's great refinement. The visitor seems to be face to face talking with the Christ and the Virgin, squeezing the intimate sorrow of Mary and the physical sorrow of Jesus, vigorously hidden . “The two paintings – Mancini explains – were the wings of a domestic altar, successively dismembered and reduced to two distinct paintings, that could be opened for the domestic prayer. On the skin cover, probably realised in a Florentine setting, even if there are Venetian recalls, you notice elegant decorative themes which form a double stamped squaring with the Christological monogram in the centre. The “told” suffering seems neither notch the beautiful face of the Virgin who gives her drama to a soft face, nor the face of Christ, who silently bears the pain of the thorns pierced in his forehead. The visitor gets enraptured facing such a soft eloquence of feelings. This is an emotion that will follow him in the voyage organised around the Renaissance Umbrian art. Let our eyes be captured by the couples of paintings representing Saint Nicola, Saint Gerolamo, the Announcer Angel and the Saint Martyr. Thanks to a deep technical and diagnostic survey the four works, of sensible executive refinement even if they are small, probably belong to the dismembered tabernacle of the polyptych of Saint Augustine, nowadays divided in various museums. A strict comparison among the four tablets and the above mentioned polyptych, realised in two different stylistic periods (from 1502 to 1512 the first one and from 1513 to 1523 the second one) permits to establish the reliability of this critical theory. These works of art, shown in the Italian enclave in this occasion, after their first presentation in public at the National Gallery of Umbria in July 2010, are worth to Vannucci the significant nickname of Divine painter. Those who visited the exhibition have been cheered up by the sweet and high humanity that shaped up in Vannucci’s studio and, that thanks to the activity of his biggest pupil, Raffaello, delighted the world. Campione d'Italia, following a tradition of excellent realizations, is proud to have suggested a very important cultural moment thanks to a great aesthetic taste and love for the art and thanks to the scientific support of the University of Perugia. “His art was very appreciated at his time, that many from France, Spain, Germany and from other provinces came to learn it”. Nowadays we can say the same thing because we have accomplished an ascetic voyage around one of the most important Renaissance Umbrian artists, changing the last word: to admire it! A New website for the European small exclaves !